In a world where the slightest shred of negativity is translated as depression or when the mere undesirable critique of your work is “being mean” and “damaging yourself esteem”, I feel we need to harden up a bit. I remember once my dad telling me,” you will thank me when you grow up knowing the real world” Of course at the time I was 10 and had NO IDEA what he meant beside the fact he was incredibly critical at what I did, said and looked. Now being 21, I finally get what he means. So often we bubble wrap children, tell white lies to people and dance around the real issues, but does this help us? Nobody has ever made improvements to themselves or the world without being critical about it. You can relate this back to cooking. Do you think the first person who tried to make a cake got rave reviews about it? I highly doubt it. I want to remember back to your first solo bake or cooking experience for a crowd. Did it turn out perfect? Most likely no. What comments did you get and which ones were the most useful? Positive or negative? Now, think about if no one ever told you it sucked. You will not progress in the kitchen because you will think you got it on the first go! Receiving real feedback is not bad, even though it does hurt sometimes (My heart died a little inside when I was reading the comments to the article that was written about my Fish and chip cupcakes) However every day I have chance to prove them all wrong and one day, maybe one day they might like what I do. On another note I have found a use for twitter! If you follow me on twitter you can see all the creations I did before I started a blog. Yes it has been two years of constant baking to get to this point. So for all the people who think I naturally got this way, think again. These photos my not be prettiest but they are thing I feel deserve a little attention. Out of all the deserts in the world trifle type desserts have to be the most difficult to make “pretty”. They just sorta, sit there. No structure or form, piles of oozing cream and drench sponge; it is hard not to make it look like complete mess. I use to think this about tiramisu. 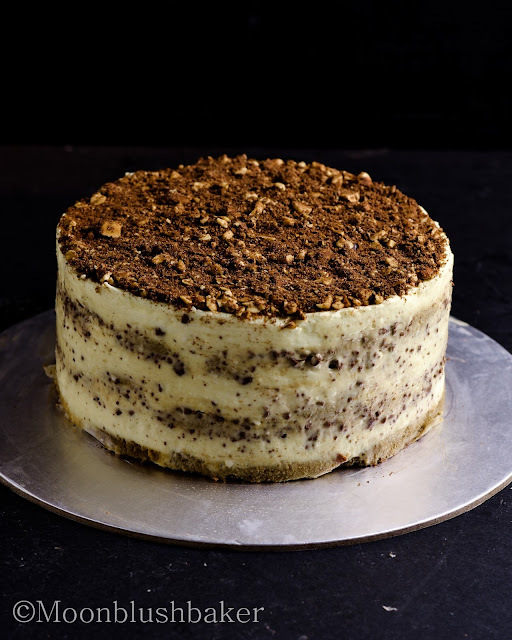 “that’s why it is always served in glass” I said, however coming across the tiramisu cake I retract my statement. 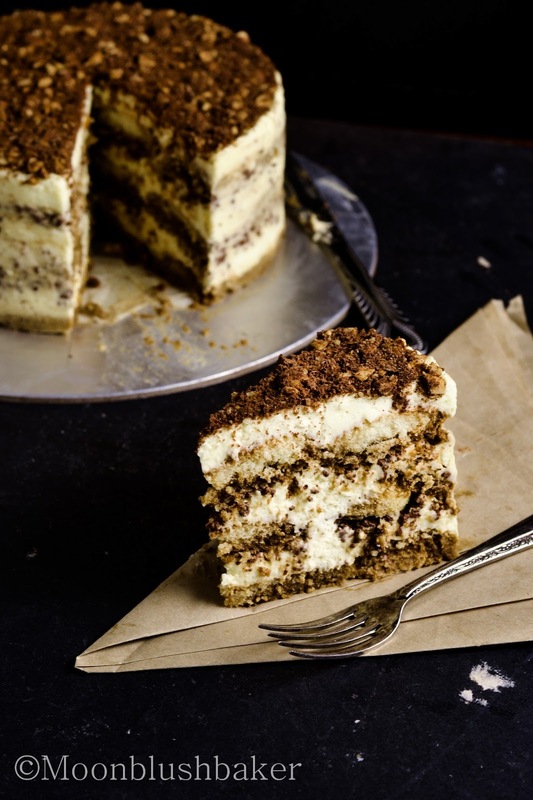 This is a tiramisu you can physically slice and it will stay that way. The wonderful light mascarpone cheese filled with beaten egg yolks, whites and cream. This is why it makes it so light on the tongue ( even though the ingredients are heavy). While I love the normal coffee rich version I feel I need to pay respect to Nigella once and a while. So inspired by her version I made a hazel nut one! 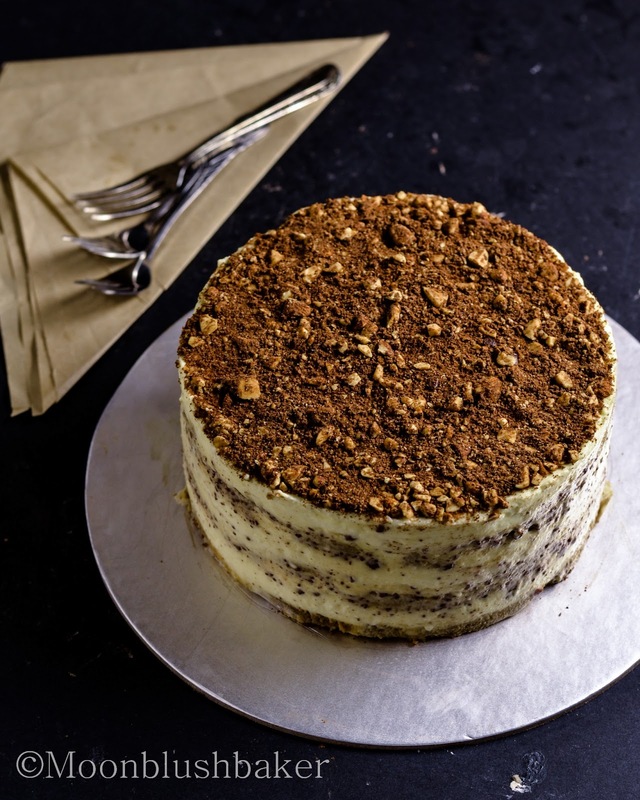 Layered in between are the traditional lady finger’s dipped in solutions of hazelnut liqueur, coffee shots and hazel nut extract. I also used some finely chopped hazelnut chocolate to line the inside. 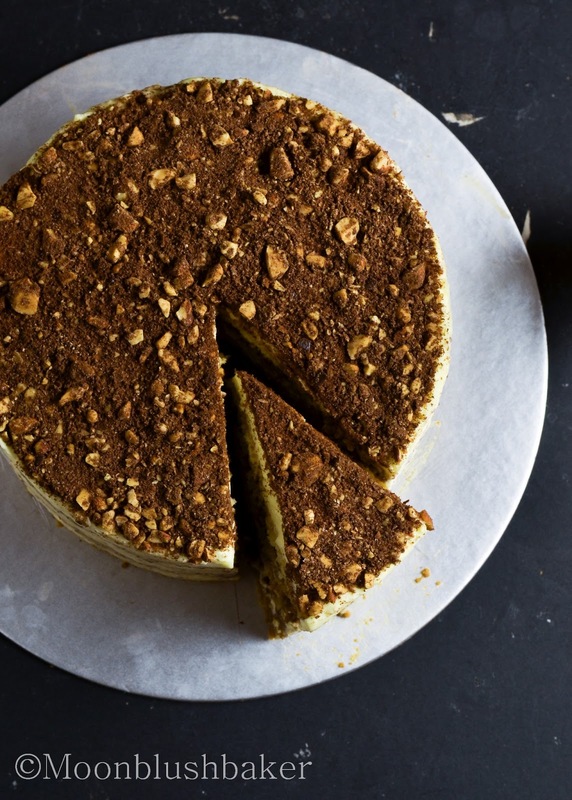 We all know this is classic so It is hard for it not to taste great, but with the addition of hazel nuts it brings a smoky depth to the light textured dessert. Line a 22cm spring form cake tin with baking paper. Make sure the collar comes up about 3cm above the rim and the base is fully covered. Make your dipping biscuit mix by pouring liqueur, and coffee mix in large jug. Fold this gelatine mix into your cream. In a large bowl, fold your whipped egg whites in to the mascarpone. Finally fold the cream into this mix. Dip your sponge fingers into the coffee mix. Make sure not to make them too wet because they will fall apart in the cake. Cover the base of your prepared tin. You may snap them in half to get better coverage. After on 1/3 third of your mascarpone mix. Next sprinkle 100g dark hazel nut chocolate on top. 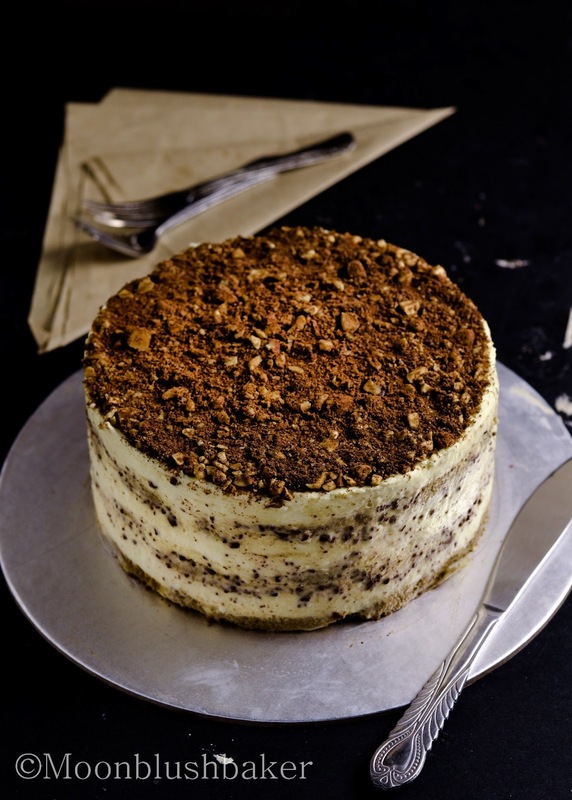 Repat these steps until you come to final layer of mascarpone. Smooth out the top and place in fridge for 6 hours. To serve, remove the spring form tin and carefully pull bake the baking paper. You may fix it by smoothing out the sides for a neater cake. When ready to serve, combine hazelnuts and coat in a small bowl.’ For decorative purposes sprinkle this cocoa nut mix on top. This cake is stunning and the photos? Swoon! This cake is just stunning! Coming from a very big Greek/ Italian family, this cake would be welcomed with open arms! That is so nice of you to say that. I actually thought the outside looked very ugly >_<. Having a big family must be nice, It is only me and my parents here; everyone else is over seas. Sign, I hope your family enjoy it! Brilliant. 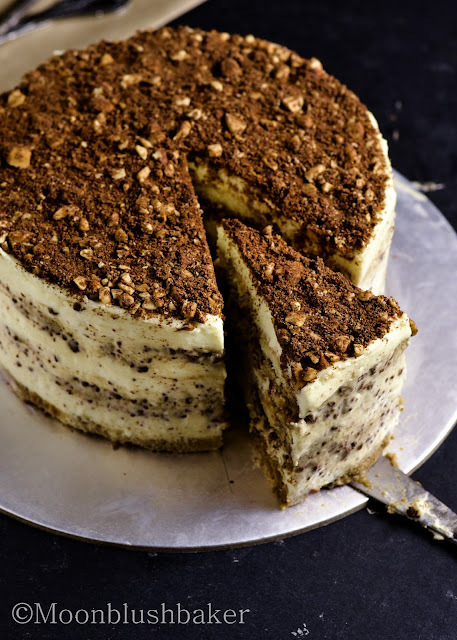 Being a traditionalist I’d never thought of doing this to tiramisu before and trying to make a tiramisu look pretty is one of the reasons I haven’t posted about tiramisu (well not exclusively) on my blog before! Next time I make one, I’ll try it like this (and credit you for the inspiration, obviously). Thanks! Thank you for your in depth comment. I think sometimes it nice to think out side Traditions because nothing is really set in stone. 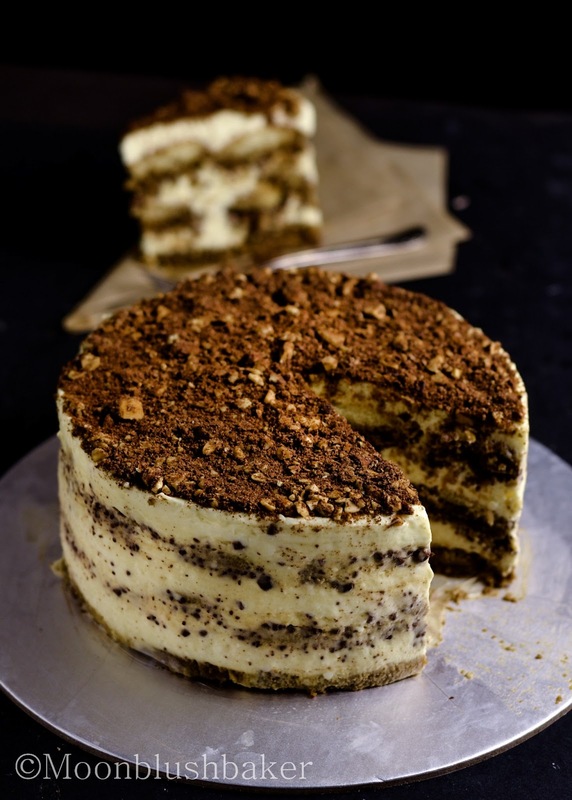 I´ve been dying to make nigella´s hazelnut tiramisu, and it looks so incredible! Some criticism is good because we do have to be able to take, but that doesn´t mean allowing others to be rude. Gorgeous cake. Such an amazingly gorgeous cake! Thanks for linking up with What’s Cookin’ Wednesday! what language would you like it to be translated into? i am sorry you felt that way . would you like top tell me what was wrong with it? Then your taste buds are stupid. Or you did it wrong. One or the other. Omygosh this is genius! Thank you for bringing this lovely creation into the world! Thank you I hope you get to try it some time!